Candlewick Press, 2015. 30 pages. Wow! 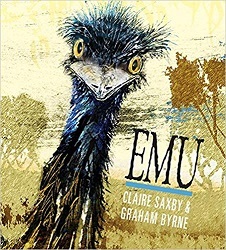 This is a science picture book — telling about emus and how they raise their young — and the artwork is simply stunning. In the open forest, where eucalyptus trees fringe tufty grasslands, honey-pale sunshine seeps to where Emu sits on a nest. Beneath him are eight granite-green eggs. Yes, him. For in Emu’s world, it is the male’s job to raise the fledgling. On each spread, we get about that much more of the father emu’s story, as well as a paragraph of straight facts about emus. The emu we’re following sits on his nest for eight weeks, without eating. He defends the eggs and then the fledglings from various predators. We watch the chicks grow until they are almost as tall and striking as their father. The facts are good and the Australian setting makes them all the more interesting. Having the story of one family of emus alongside the facts is helpful. But what makes this book truly exceptional are the strikingly beautiful paintings. This book is a joy to leaf through. This is another book I plan to booktalk in some elementary schools for this summer. 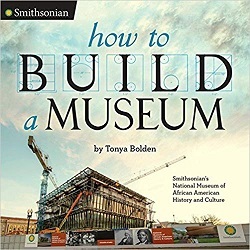 It’s always a treat to find nonfiction that will draw kids in. That emu staring out from the front cover beckons kids to find out more. Greenwillow Books, 2016. 36 pages. 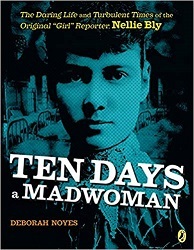 I read about the creation of this book in Horn Book Magazine, so I was predisposed to like it. Vera Williams wrote the text many years ago, but set it aside until last year, when she felt the time was right. But she knew she was at the end of her life, so she’d need some help to finish the book, and she asked Chris Raschka. The result was that they collaborated on the book, and Chris completed it after she died on October 16, 2015. The story might have been trite – an orphan child living in a home is being adopted – but this particular story is told with depth and warmth and love that makes it anything but typical. It’s also a long text for a picture book, so it’s not exactly a storytime selection, unless it’s for an elementary school classroom, but it would make lovely cozy family reading. 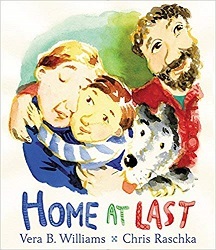 The book opens as Lester is waiting eagerly for the arrival of Daddy Albert, Daddy Rich, and their dog Wincka, who are going to finally adopt him. When Lester moves in with them, they give him his own room. Lester needs his suitcase filled with action figures to protect him. But every night, Lester wakes up in the night and stands by his daddies’ big bed, with Wincka sleeping at the foot. Every night, they wake to see him standing over them. What Lester wanted was to climb into his parents’ bed, too. More than anything, he longed to wriggle right into the middle of that bed, with Daddy Rich on one side and Daddy Albert on the other side and fat old Wincka at his feet, and to have his action figures in their blue suitcase right on the floor beside them. That way he knew he would be safe from everything bad in the whole world. Lester never told Daddy Rich and Daddy Albert about this. But every night, as though he had an alarm clock ringing in his belly, he grabbed his suitcase and made his expedition down the hall and through the door to the side of the bed. Lester’s daddies have trouble with this. I appreciated the paragraph that expressed their thinking. Daddy Rich and Daddy Albert had decided, long before they finished adopting Lester, that it was important for their new little boy to have his own room and his own bed. They had spent many weekends painting the room and finding the right bed for the boy who was coming to live with them. And they surely knew, from living with Wincka, how impossible it was to get a creature out of your bed once you have let that creature in, if only in an emergency . . . if only for a few nights. The problem goes on though. The daddies try to help. They do lovely things together with Lester. They look forward to him settling in to school and feeling at home in the neighborhood. They do have some setbacks as well, but it’s clear they love Lester and want to do what’s best for him. Finally, the solution – and a lovely one – comes from Wincka. But he also loved when his new cousins – all four of them – stayed over on Saturday nights. They laughed and jumped around and played and played so much that they hardly slept a wink. And at first light, they piled right on top of Daddy Rich and Daddy Albert. “Help! We’re being attacked!” the daddies shouted, dashing through the house chased by cousins and Lester and Wincka and even Silver. And then it was pancakes for everyone. And then an entire day of more games and walks and snacks and fun together. Lester was truly home at last. Here’s a lovely warm book about a little lonely boy who needs a family – and finds one. I like the way it tackles head-on that he needs extra reassurance, and it isn’t easy – but he does find a home. And that reassurance. This book is a lovely legacy for an outstanding picture book creator. I also love the way the pictures are a wonderful blend of her style with Chris Raschka’s, creating something new. A Tarcherperigee Book (Penguin Random House), 2013. 205 pages. Here’s the idea: The author has taken serious science experiments that psychologists have tried on babies and tells parents how to adapt them and try them on their own kid. The experiments start with newborn reflexes and progress to experiments with language and following instructions for toddlers. One thing I love about the book is that the experiments are not designed to tell you if your child is ahead or behind their agemates. 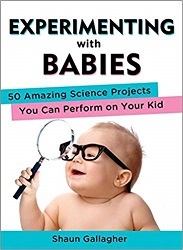 The experiments are simply a fascinating look at human development in general and your baby in particular. For example, one experiment has you ask two friends to greet each other in front of the baby. But then you do it again, later, but the second time, they greet each other with their backs turned to each other. The fascinating research is that 9-month-olds don’t react any differently to one or the other – but when researchers tried this (with a video) on 10-month-olds, they looked longer at the one with their backs turned. Somewhere in that time frame, babies figure out that people usually look at each other during social interaction. I thought this one was really funny. For a child around 13-15 months, you put a toy on the table in front of you that you can activate with your head (causing some sort of light or sound). Then you put it in front of the baby, and see if they will activate it with their head or with their hands. The fascinating thing is that if you do it showing that your hands are full, the baby is less apt to use their own head to turn the toy on than if you do it with your hands empty and available. The baby seems to reason that the only reason you used your head was because your hands were full. But if your hands were free and you used your head anyway – then turning it on with your head must be what you’re supposed to do! Human development is fascinating, and these experiments give you a little window into how your child is growing and changing and learning. Dial Books for Young Readers (Penguin), 2016. 40 pages. 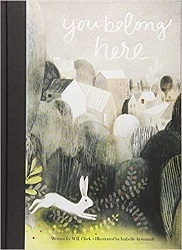 Here’s a lovely and poetical picture book. 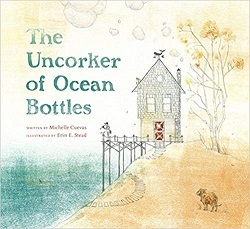 The story is simple, about the Uncorker of Ocean Bottles, who lives by the sea. He had a job of the utmost importance. It was his task to open any bottles found at sea and make sure they were delivered. The Uncorker of Ocean Bottles often has to travel far to deliver the messages. Sometimes the messages were very old, crunchy like leaves in the fall. Sometimes the messages were written by a quill dipped in sadness. But most of the time they made people quite happy, for a letter can hold the treasure of a clam-hugged pearl. The Uncorker of Ocean Bottles does wish a message would come for him. Then one day a very peculiar message comes. I’m not sure you will get this in time, but I am having a party. Tomorrow, evening tide, at the seashore. He asks many people about the letter, if they recognize the script, but he is unable to deliver it. The first time he hasn’t been able to deliver a note. As he fell asleep that night, the Uncorker decided to go to the seashore the next day. He would go, and apologize to the writer of the note. Well, when he arrives, all the people he asked about the message have come, too. They have quite a party by the seashore. He decides to try to deliver the message again tomorrow. Mind you, this is a picture book about which I have to let go of my logical objections. But it is so beautiful! Erin Stead’s art work is so peaceful and profound, and the language so lyrical and lovely. (“the waves tipped their white postman hats…”) It’s such a joyful experience, I’m not going to let little logical questions get in the way of my enjoyment, and I strongly suspect children won’t either. Like most picture books, I recommend trying this book out to see for yourself the whole effect of the words plus the pictures. I suspect that you will be glad you did. Little, Brown and Company, 2016. Originally published in the United Kingdom in 2015. 28 pages. 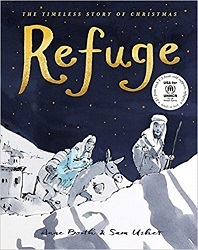 Yes, this is based on the Christmas story, but it focuses on Jesus’ family as refugees when they traveled to Egypt. You don’t have to know anything about Christmas to appreciate this book. And it seems timely whether during the Christmas season or not. The narrator of the tale is the donkey who carried the family. It tells briefly about traveling to Bethlehem where the baby was born and visitors came. When the last king left, the scent of frankincense lingering in the air, we all slept and the man had a dream. He woke long before the sun rose and told the woman. She took the baby and kissed him. She smelled his sweet baby breath, and felt his soft, warm baby skin and how his lashes tickled her cheek as he sleepily nuzzled her neck. “Time to go,” she said. and from the baby’s tiny first smile. And we entered into Egypt . . .
. . . and we found refuge. The illustrations are water colors with a simple palette – mostly purply-black and white and gold, but with a little blue for Mary. The story is simple and haunting, and presents a way of looking at the Christmas story that had never even crossed my mind. 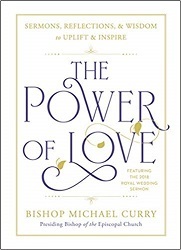 In addition, the cover of the book informs us that for each book purchased in the United States through September 2017, the publisher donated a dollar to the UN Refugee Agency. A simple way to talk with your children about refugees and to open your own heart. Yes, all with a simple and beautiful picture book. 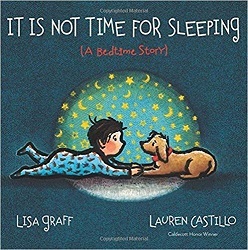 I was ready to dismiss this book as a fluffy book to make parents feel good – but the more I read it, the more it won me over. The book talks about where various things in nature belong – whales, fishes, waves, dunes, trees, deer, birds, frogs, lilies, turtles, otters, cattails, carp, and more. whenever the storms start to blow. After two spreads about things in nature, the book always comes back to a picture of a house with a lighted window and a page of poetry about how you belong with me. But if I shift gears and think about a little one, cozying up with Mom or Dad – isn’t that a wonderful message to convey? You belong here. You are loved, and you belong. And yes, even when you’re grown up and wander far, you will always have a place in my heart, I will always feel at home when I am with you. You are currently browsing the Sonderbooks blog archives for December, 2018.